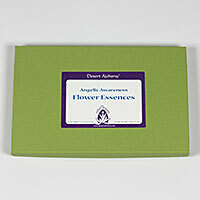 This is a series of flower essences we created together with Solara. Solara is the author of several well-loved metaphysical books including, Invoking Your Celestial Guardians, The Legend of Altazar, 11:11- Inside the Doorway, and How to Live Large on a Small Planet. In her capacity as a Messenger to Humanity from the Golden Angels, Solara travels extensively throughout the world giving lectures and workshops on Angelic Awakening and Empowerment. In these experiences, the Golden Angels are contacted, anchored and aligned within the third dimensional body. This is the breakthrough into multi-dimensional awareness that truly transforms lives. By reactivating the pre-encoded cellular memories, and reawakening the star lineage, we are assisted in remembering and fulfilling our Divine Purpose. These flower essence formulas were specially created for my workshops on Angelic Awakening and are now available for the first time to everyone. I have used these flower essences since 1987 in my work with hundreds of people and find them both gentle and extremely effective. They are prepared by Desert Alchemy with integrity and purity of Spirit. They truly aid and accelerate the process of reuniting with our Higher Selves so we may more fully embody our higher Presence here on earth. I highly recommend them to everyone ready to make the quantum leap into multi-dimensional awareness. The purpose of these flower essences is to support us in awakening to angelic presence and working in co-operation to fulfill our divine purpose on the earth. Although you can use any of these flower essences on their own or combined with other essences, many people have found that by using them in the following order they had the very best success with the process of angelic awakening. Each essence has been empowered by the success of many people around the world in attaining angelic awareness, as well as by the Nature Kingdom through each flower contained in the formulas. The Golden Star ever above you could also be termed God, home, the Oneness. This essence brings in that Golden Light, sending it throughout your body and anchors it in your toes. This essence brings anchoring and integration of the multi-dimensional frequencies throughout your being. It facilitates balance and grounding.